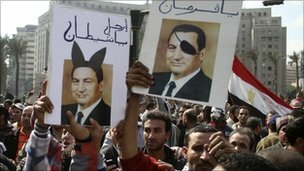 BBC News - Egypt unrest: What if Mubarak goes? The events of the last week will have profound consequences for the Middle East for years to come. Egypt's role in the region is going to change. President Hosni Mubarak has been the central pillar of the alliance between Western powers and authoritarian Arab leaders and without him it may not be sustainable. He has been the only Arab leader the Israelis trusted. Their biggest fear is that without him their cold - but so far resilient - peace with Egypt will be in danger. The president has been the West's necessary man in the Middle East for 30 years. 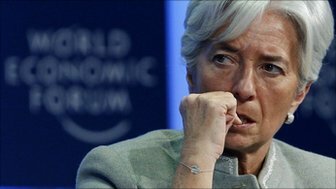 That is why Egypt has continued to receive vast amounts of American aid, as well as political support from Britain and other European countries - despite a deplorable human rights record, crooked elections, the suppression of virtually all organised political opposition and rampant corruption. Those are some of the reasons why tens of thousands of people have taken to the streets. His allies were already planning for what would come next, because he is 82. But for them the easiest assumption was that he would be able to bequeath the Egyptian system largely intact to a chosen successor. Favoured names were his son Gamal, or the intelligence chief General Omar Suleiman. The crowds on the streets have almost as much contempt for Gamal Mubarak as they have for his father. Gen Suleiman has been the second most powerful man in Egypt for years, the main link with the Americans, the Israelis and the Saudis. In the eyes of the protesters though, he has been tainted by agreeing to become a vital part of President Mubarak's survival plan. The popular uprising makes it unlikely that the current system will survive President Mubarak. Optimistic Egyptians say free elections, if they ever happen, would produce a vibrant democracy. Pessimists say that the removal of the police state would lead to chaos - which would be exploited by Egypt's jihadi groups. These have been suppressed ruthlessly by the Mubarak regime. The country's only properly organised mass political movement outside the ruling party is the Muslim Brotherhood, and it would do very well in any free election. Live coverage of unrest in Egypt, where protesters have taken to the streets for a fourth day. Will there be a domino effect? Egypt's army vows it will not use force against demonstrators, as the government says it is preparing to open talks with the opposition. Should advertisers be banned from tracking the online behaviour of children? BBC © MMXI The BBC is not responsible for the content of external sites. Read more.